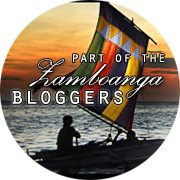 This tag has been circulating around the Zamboanga Bloggers Group for a while now. I know it's kind of late to do this tag but, oh well here it is. How does it feel being in a new school? I bet being in an all girls school is something new for you since you have been used to Co-Ed ever since you were young. Don't worry about it, hanging out with a bunch of chics will help you increase your self awareness. I know right now things are difficult for you. You thought that migrating to another city is the best solution for everyone. I regret to tell you, it's not. Dad lost his campaign in his hometown. Because of that, it teared the whole family down. Mom have had enough so she decided to let you stay at your grand uncle's home while she's back in Zamboanga. During this time, I know you're on your own. Jen, I know how stubborn you are. You think that you can have things your way. You thought that your grand uncle and your relatives would submit to the things you are used to. Well, they wouldn't. Though they are your relatives, that is not your home. You are not a princess anymore. You left your friends back home. You have a lot of things to learn. You will be forced to grow early and make decisions that are too big for you. Don't worry, you will soon realize that you don't have to go through all those alone. 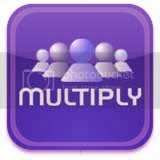 In school, you will meet different personalities that are unfamiliar to you. This is the time you start to struggle with trust. You don't know who you should believe nor rely on. You didn't want anyone to know the real you. You were too ashamed to admit you're lost. So you lied, and lied, and lied. Your classmates started to judge you and made fun of you. The two best friends you thought you can rely on would turn their backs on you so don't get yourself attached because you won't be able to forget. Don't worry about it, you will still be able to find a true friend in your class. Remember Sharmila? The one you used to have difficulty figuring out? You will still find yourself hanging out with her 7 years from now. I know that you're thinking of going back to where you were from. Go ahead. You are still too young to be on your own and you have to accept that age pays a high price for maturity. Your parents are back together again but don't expect the trials end there. You will meet your first boyfriend when you come back home. Don't expect him to be the last because he's not. I'm sorry to tell you that it's going to be a unhealthy relationship. Every fight will lead to violence. No, Jen, it's not normal. No, you can't change him. No, you can never live according to his standards. You will be choked because people expect you to be perfect at all times. You should understand, you're only human. Around 2007, you will surely meet someone who would help you open your eyes to a lot of things. This person would make you feel certain things that can't be explained. You will surely ask yourself why. That question will remain in you for the years to come. I wish I could tell you the answer to your questions but up to this day, I still haven't figured it out yet. Until then, you will just have to be patient. Follow your dreams. College is full of fun, too. So live it up while you can because things will get serious when your done with school. Peter will be there for you aside from your parents. Study hard, okay? Your friends that you fought with when you were in high school and those people that you had confrontations with back in college, they would underestimate you. So expect them to belittle you, judge you, call you dumb and insult your school. Don't worry about them, you will eventually prove them wrong when you finally become a registered nurse and when you go to med school while they're too busy wasting their college courses over irrelevant jobs for the sake of money. So, smile and be thankful that despite the problems that you will face along the way, you still have your dream. You still have the chance to build your future. Wheb you're finally in med school, things will start to change. You will learn independence. You will learn to leave home. You and your parents thought you won't make it on your own. Congrats, Jen, you just did because I'm writing this letter inside the room that I'm renting near school. You would be able to move to your new home as soon as it's done so be patient. Above all, stay humble. You may be feeling sorry at others who used to degrade you but remember that you are all created equally. One day, you would be able to appreciate them as they are. The most important thing is to keep the flame burning. You have this strong desire to become a physician someday. Believe in yourself and have faith that God is with you at all times. Stay positive, Jen. Hey guys! It has been a while since I last wrote an entry. I’ve been through a lot for the past few weeks and it has been the busiest and the most difficult year by far. Wooh. Anyway, enough rambling. I have decided to share to you some of the easiest and healthiest ways of taking care of your curls whether it’s natural or salon treated. For those of you who already have curly hair or are planning to have their locks curled, I hope these steps would be helpful for you. I know that this may seem to be the hardest thing to do and it can be such a hassle when you are rushing in the morning. However, you should know that towel drying your hair produces friction as it makes your hair more brittle. Remember, hair is at it’s weakest when it’s wet. Blow drying your locks also strips out your hair natural moisture especially if your curls are salon treated. If you must, use a heat protectant and make sure your blow drier is at it’s coolest setting when you dry the hair. Leave your wet hair as it is and I promise, you would be able to see better looking and more manageable curls when it dries out. This is obviously a no brainer statement. This is the Hair care 101 for curly hair. You don’t want to cause split ends and you don’t want to ruin your hair. If you feel like there are so much tangle going on, use a wide toothed comb for your hair. Use a conditioner when you shower to keep your curls soft and smooth all day. 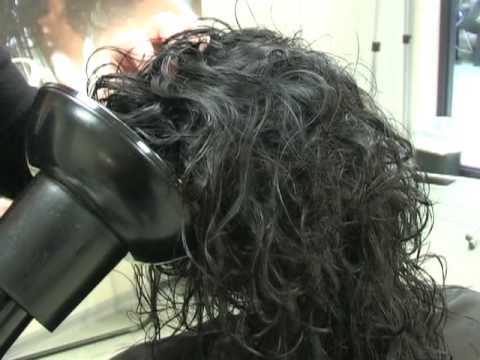 Even though you think that your hair is not at all damaged, do you really have to wait till your hair becomes dry and brittle before you use a treatment? Prevention is always better than cure. Curly hair is very prone to damage compared to straight hair. 4. Use a product that is appropriate for your hair type when styling. Assess your hair if it’s limpy or frizzy. Volumizing mousse for limpy hair and anti-frizz mousse for the untamed locks. There are a variety of products to choose from in the market. If you wish to keep your curls in place without them looking very stiff, choose a curl defining mousse that has self-adjusting properties. 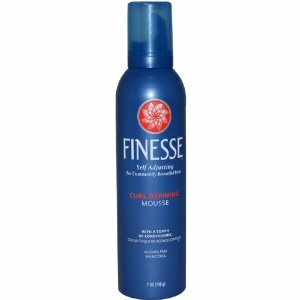 I personally like Finesse Curl Defining mousse. It really emphasizes the curls while keeping it natural looking! I finish the look with a good hair polish to make it look extra shiny and keep it from looking dry. 5. Let your hair breather once in a while. Since curly hair needs a lot of maintenance and styling, it is important to keep your hair from product build ups and just let it loose. On a weekend, wash your hair and just let it be wild and messy! (Make sure you don’t have plans for the day) Also, it really helps if you restore moisture back to your hair by applying treatment. I personally believe that since hair becomes brittle from all the chemical products, it doesn’t help at all if you treat it with chemical products as well. I prefer to use natural products since they help nourish the hair back to health and they don’t have chemical additives. My favorite go to treatment is Mayonnaise. 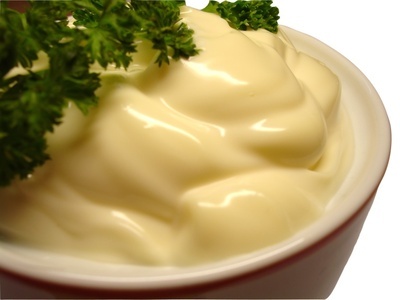 I know it sounds weird to use that but mayonnaise contains fats and oils with emulsifiers that help bring back the natural oils to your hair. It literally fattens up your hair. I’ve been using it for a while now and I never had split ends nor dry hair since then! Plus, it makes the hair extra shiny! 1. Assess your hair type. Is it thin? Is it thick? If you have thin hair, curly hair may add volume and texture to your hair. However, if you have thin hair due to hair fall, think twice before taking the leap because introucing chemicals to your hair will surely add damage. If you have thick hair like mine, think well if you are prepared enough to have the big hair. Thicker hair means bigger maintenance. 2. Assess the level of damage to your hair. If you have dry hair because of the many salon treatments you have had before, it is wise to just let your hair have a break. Many girls think that if they curl their locks, the damage would look less visible. That’s a wrong perception. You have no idea how much it can exacerbate the condition of your hair. If you have normal or oily hair, it doesn’t make your hair safe. You should keep the moisture by putting extra efforts in taking care of your hair. 3. Think about your level of commitment. Everyone can have curly hair but not everyone can pull the look off. I see a lot of girls who get easily tired of curly hair and just decide to have it chopped off or straightened then the next thing I find out, they already have poorly damaged hair. 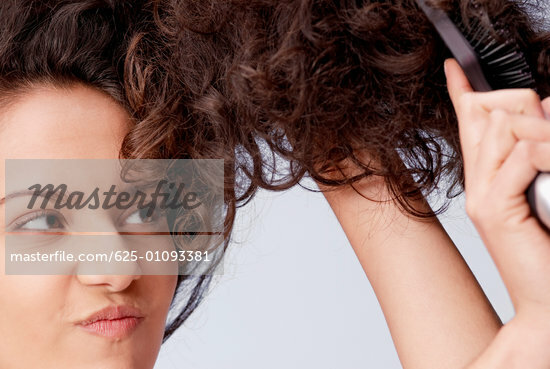 Curly hair is the most difficult to maintain so if you are too lazy to take good care of your hair or you have no time for these styling rituals, better be safe than sorry. 4. Master your facial features. You may have the perfect hair, you may have all the time in the world to style your locks but all of these would be useless if curls don’t fit your features. Always remember that curls emphasize the shape of your face. So if you have round or square face, be careful of that. There’s one good news though, you can always do something about it as long as you know which length you should have, how big the curls have to be and which style of hair cut fits your facial shape. Ask your stylist about it. So there you have it. Sorry for the long post though. I just thought I’d share some of the things I have learned. All of these information are based on my experience with managing my hair. It took me like two weeks to just get things right since I have already thought about having my locks curled for the longest time but never actually prepared myself for this kind of mishaps. Hahaha! Over all, I like it a lot and I feel like a brand new person with it. So this is a photo which I took the day I got my locks curled. Notice the frizz especially on the ends? Hey guys! I know I haven't been updating much on my blog. I've been really busy with work and it has been stressing me out since day one. It's a good thing that I have a best friend who would dare to cross the borders with me just to unwind and have a good time despite the crazy hustle and bustle of city life. Isn't this scenery breath taking? It was a hot humid day but not even the summer temperature could stop us from enjoying the view! Would you believe we only rode a jeep to reach this place? LOL :) Sharm and I decided to meet at SM Cebu mall and looked for a jeep to Liloan. Liloan, by the way, is far from the city proper. It's almost on the countryside. It took us an hour to get to the Papakit's Resort. It was our first time there. Meet my best friend, Sharmila. I always call her Shawarma just because her name reminds me of Early Bird s Shawarma! At first when we got there, I thought the place was just all pond and cottages because it looked like there was nothing else to see. There were people riding boats and fishing out at the pond. I thought we would do the same. After a long chat over lunch, Sharm and I decided to walk around and explore nature. The place reminds me of the primitive style of living which to me is very serene and calm. This is what we saw when we rode a safari bus to the top of the mountain. The view is just magnificent! See the two people strapped on to the cable? This place is perfect for those who like to unwind and reflect once in a while. 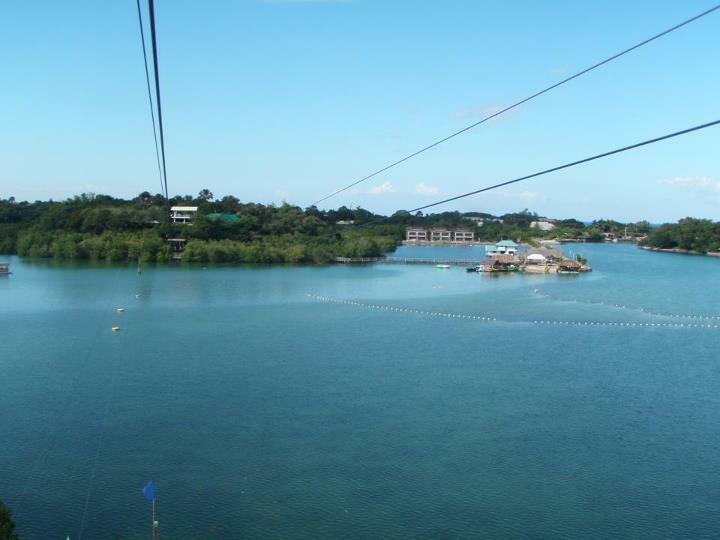 Sharm and I decided to try the Hanging Bridge. The harness felt too tight! The staff was kind enough to help us with the harness. They were very accommodating and friendly. They even allowed us to choose the color of our helmets! Hahaha! This is it. Are you ready? 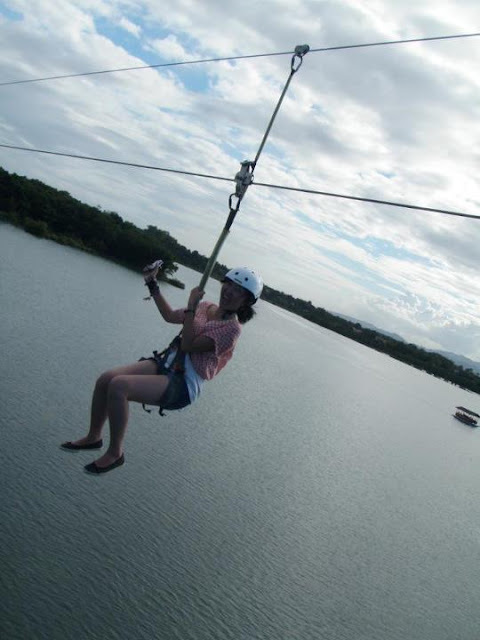 The zipline was definitely the highlight of our adventure. We conquered 800 meters back and forth. We just couldn't get enough of it. While we were watching the other riders, they seem to take too long to finish the 800 meters but when it was our turn to ride, it felt too fast like it was less than 50 seconds! MORE!!! I was too giddy to keep my poise. Hahaha! Don't forget, work hard. Play harder. Thank the blogger who awarded you and add a link to their blog in your post. 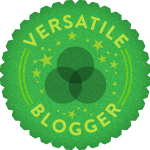 Share the award with 15 other recently discovered blogs that you love and inform them! I love pizza, chocolates and milk teas! I have a very soft spot for the elderly people. 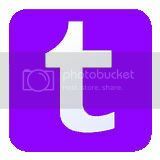 I am big on Violet colors and shades! So this post is not the typical Beauty and Fashion article that I would usually make. This post is more about my thoughts and recent realizations. I don’t know if it’s just me or is life getting more serious now than it was before? I feel like I have completed all the things that I wanted to try and I’m getting tired of them. I just want to be able to grow as an individual. I want to learn more. I want to earn more. I want to give more. I can’t believe I am saying this but it is as if I am ready for a new responsibility. Everything was at the greatest peak until things have started to change. I started to feel tired. I got what I wanted. What’s the point now? This whole chilling out was getting tiresome. I counted how many times I went out to party since I passed the NLE. I only went out less than 5 times. I enjoyed staying at home and being a home buddy. I enjoyed talking to Peter about life and plans for the future. I enjoyed helping out in the office when I can. I enjoyed reading different articles about health. Most importantly, I enjoyed going back to the basics. I looked for my friends to have meaningful conversations. My two best friends were busy. One of them just graduated from college while the other is in Law school. My two other girl friends are currently living in the States. They were my comfort and I miss them a lot. My close friends were also busy with their other friends. The only time I got to see them is when we were at Catribo and they happen to be there. I tried to get a hold of them but for every time I tried, there was nothing sensible to talk about. We were growing apart. I don’t want to talk about other people and their dirty closets. I don’t want to talk about friends of friends that I don’t even know. I don’t want to talk about exes and how shameful they look like now. I don’t want to talk about guys and their rides. I don’t want to talk about partying and getting wild. I just don’t want to talk when there’s nothing worth talking about. Call me boring but I don’t see any sense to that stuff. I’m starting to become choosy with friends. I want to have a friend that has a good influence, someone who can come over and stay the whole day at my house as we watch different DVD movies rather than party and talk about boys. After all, friends are an extension of yourself. When Sharmila came and visited me from Cebu, we had a lot of fun trying new things. We went to the barter. 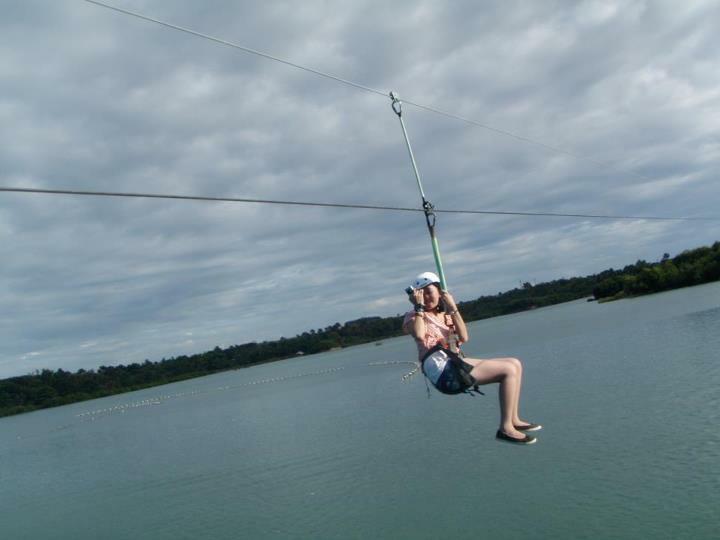 We rode the zip lines. We watched the sunset. We went out for a swimming and had dinner later that night. We also partied with my friends. All those happened in just 2 days. While partying, we were inside the Halo. I was very hesitant to have fun because of last year’s incident with Peter. I sat in the corner for almost 2 hours while the others were all dancing. I was not influenced by alcohol at all. I was just watching all the people crowding inside the small pub. I noticed that most of the girls were intoxicated and sweaty. They were dancing heavily while the guys slowly moved toward them and tried to take advantage. This is the main reason why I don’t go to a disco pub with girls only. I should really have guy friends with me especially my boyfriend because I don’t want perverts trying to have their hands crawl on me, let alone come close to me. Peter had surprisingly loosened up for me and I was starting to go back to my good mood. Things went well and we all enjoyed the night. I know that this only happens once in a blue moon. I thought to myself, “Is this the kind of night life I want to enjoy every other weekend? Girls coming in killer heels and skin tight clothing with their thick makeup on then leave looking all like they just came out from a terrible cat fight? I would rather wear a cute dress to a nice dinner and head to the boulevard for a balot and chicharon.” Yes, I would rather eat cheap than look cheap. I’m sorry if this may sound offensive but this is after all, my perspective. I just feel like, there's more to life than just all the partying and having fun. It may sound strange that all these come from a carefree person like me but then I realized, what's the point of having fun when there's no good reason for it. I wanna have fun because I accomplished something great, not because I am bored. The socialites that I used to hangout with have now become strangers to me. It's okay, I don't mind. In the end, you have to choose whether to keep living your life the way they live theirs or give yourself direction and make a better difference. I would always go for the second option. I bet a lot of us bloggers here are already on our early 20s. At this age, our skin is at it's healthiest and our collagen production is full. However, as much as I hate to break it to you, by the age of 25, our healthy cells will start to deteriorate and our collagen production will decrease. This is the start of aging process. Once you age, you can never reverse it unless you go under the knife. Age repair creams are useless. I repeat, useless. My mom is a complete health freak and she's very conscious about her skin. She's already 49 ( turning 50 in a few days ) and she only has little fine lines. I grew up watching her do her beauty rituals and I must say, it doesn't take much money to keep yourself healthy and glowing. However, it takes a lot of discipline to do so. 1.) Avoid the sun - The first step to any good skin care routine is keeping it out of harm’s way. Simply put, limit your skin’s exposure to the sun as much as possible. All the UVA and UVB rays fry up the skin surface and cause collagen break down causing you dry skin and wrinkles. It's almost impossible to stay away from the sun because we're not vampires but it's best to avoid it from 8am-4pm where the sun is at it's hottest peak. For those who like to sun bathe, good luck! 2.) Sun block is a must have! - So you think that an Spf 15 can already protect you? think again. If you are confused by how Spf works, let's not get into complex explanations and just think of it as this way, the number of Spf is the number of times it can protect you. Spf 15 can only offer 15x protection to your skin. Spf 30 can only offer 30x protection from the sun. Since we live in a very hot humid weather, it is wiser to use Spf 50 for those who go to school or work. For those who are always outdoors, Spf 100 is your best choice. Apply sunblock every 4 hours. 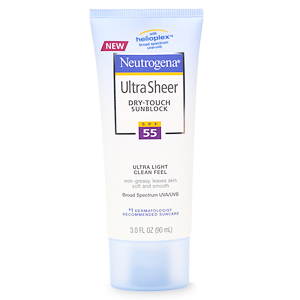 If you need a sunblock that doesn't have a greasy feel, Neutrogena Helioplex Dry Touch sunblock can be your bet. It absorbs really well. You can find this at Watsons and other grocery stores. 3.) Moisturize - All skin types need to moisturize, even the oily ones. However, you have to understand that skin types have different needs. You need moisturizers that fit your skin type. For dry skin, choose moisturizers that are creamy. For oily skin, gel-based moisturizers will fit you best since it is easily absorbed by the skin and does not grease your face. For acne-prone skin, there are a lot of moisturizers in the market that are created for sensitive skin. I researched on drug store products that are commonly found here in our country so you can get access to them if you are on the hunt for moisturizers. 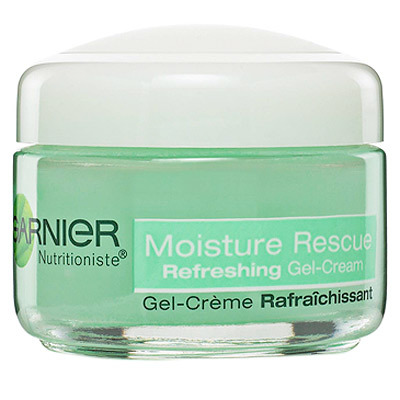 This gel base moisturizer is best for oily skin. You can usually find this at Watsons. Olay is very much known for it's ultra moisturizing properties. This may be perfect for dry skin. you can find this at every grocery stores in the city. 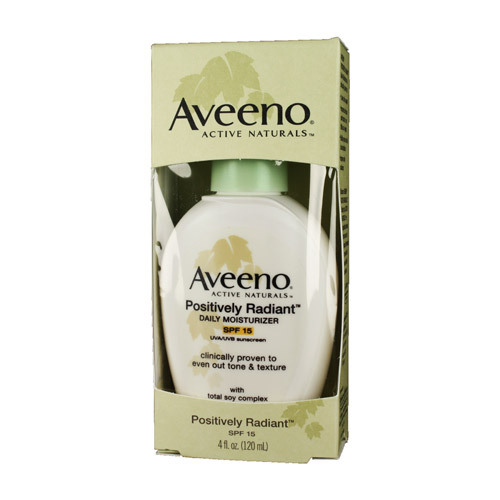 for acne prone and sensitive skin, Aveeno is by far the most gentle moisturizer you can find in the market. In line with that, you can also find Neutrogena and St. Ives. They also work wonders! 4.) Exfoliate - Exfoliation helps promote cellular renewal by stimulating the fibroblasts. Remember the things that produce collagen, elastin, and GAG’s (providers of ‘snap back’ and hydration). Scrub 1-2x a week. If you are using a product that already contains Alpha, Beta and Polyhydroxy Acids which are simply applied and left on the skin, you should limit your exfoliation to once a week since these substances already peel off dead surface skin cells. You don't want to thin out your skin. Never ever use body scrubs on your face because these products are really aggressive for the delicate facial skin. Make sure you wear sunblock if you're going out after exfoliating the skin since the new skin layers are fresh and fragile. 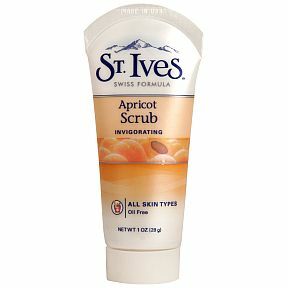 St. Ives is renowned for the best scrub amongst drug store products. 5.) Invest in a quality pair of sunnies - Believe it or not, it is an everyday essential. The skin around your eyes are the thinnest amongst any part of your body. It means that it is very fragile and prone to wrinkling especially if you are under the sun and you squint a lot. The sun breaks down your collagen resulting to loss of skin's elasticity especially around the corners of your eyes. If you think that a random pair of sun glasses can already get you through, think again. The cheap ones that you can easily buy around the corner do not have UVA and UVB shields to protect your eyes. You will know if your sunnies are of good quality if you don't squint under the sun while wearing your sunnies. If you still do, better invest in a good pair! Remember to buy sunnies that can cover your whole eye area including the brows. 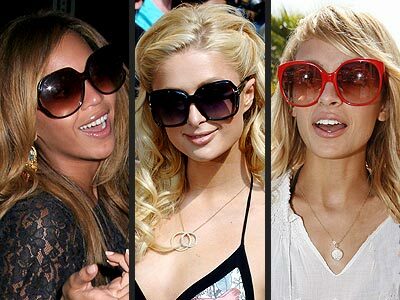 If you don't know the right sun glasses for your face shape, click here to view my tips on this. 6.) Avoid makeup - I hate to break it you ladies but makeup does a lot of harm than good in your skin. The chemicals used in cosmetics, some of them are good and most have bad effects. Many people use makeup on daily basis. An alarming amount of cosmetics can actually be absorbed into the skin or breathed into the lungs. Cosmetics are manufactured using different chemicals and some of these chemicals are linked to health problems and most common problems include cancer or other allergic problems. Parabens are chemical preservatives that have been identified as estrogen and disruptive of normal hormone function. It is the exposure to external estrogen's that have been shown to increase the risk of breast cancer. Athletes have been known to cause a broad range of birth defects and lifelong reproductive impairments. Be careful with the things you put on your face, especially eye shadows and eyeliners. Not only will they wrinkle your skin but they may cause harm to your vision. If you really need to conceal little flaws or balance out your skin tone, try tinted moisturizers. 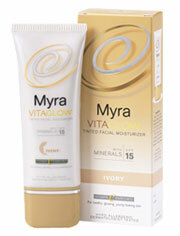 I have this, Myra E moisturizer and it provides a medium but smooth coverage. You can never go wrong with the price! 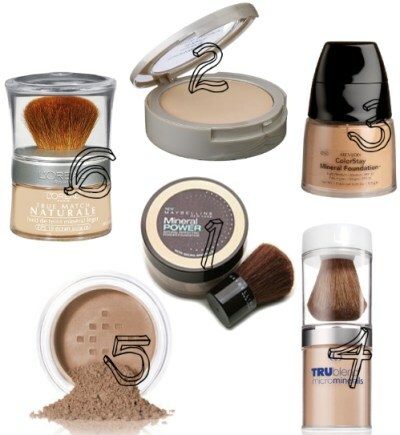 You can also opt for mineral foundations and powders. They provide good coverage and are a lot safer on the skin because of their organic ingredients. 7.) Load up on Vitamins - Antioxidants are known to prevent agents called free radicals from damaging cells in the body and the skin. Free radicals are a result of normal body processes, but they can also be created by exposure to various environmental factors such as smoking or ultraviolet (UV) radiation from the sun and can speed up the aging process. mineral selenium helps protect the body from cancers, including skin cancer caused by sun exposure. It also preserves tissue elasticity and slows down the aging and hardening of tissues associated with oxidation. Dietary sources of the mineral include whole grain cereals, seafood, garlic, and eggs. Experts consider vitamin E to be the most important antioxidant because it protects cell membranes and prevents damages to enzymes associated with them. 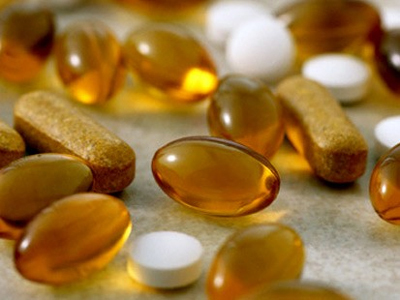 Supplementation with vitamin E in 400 milligrams a day has been noted to reduce photodamage, wrinkles and improve skin texture. Natural sources of vitamin E include vegetable oils such as sunflower oil, grains, oats, nuts, and dairy products. Vitamin C is the most common antioxidant found in the skin. It's also found in vegetables and citrus fruits. Like vitamin E, vitamin C is considered important in repairing free radicals and preventing them from becoming cancerous or accelerating the aging process. 8.) Eat right! - You can never look glowing on the outside if you are not healthy on the inside, makes sense? Fruits and Vegetables are clinically proven anti-oxidants that get rid of free radicals from the body. Not only do they provide vitamins that nourish the cells, they also combat diseases by strengthening the immune system. I know not everyone likes to eat vegetables which is why it takes a lot of discipline to be able to get into the habit of doing so. If you have noticed, vegetarians not only live longer, but they have very healthy complexion. You don't need to become vegetarian to achieve healthy skin as long as you follow the right amount of serving of fruits and vegetables. 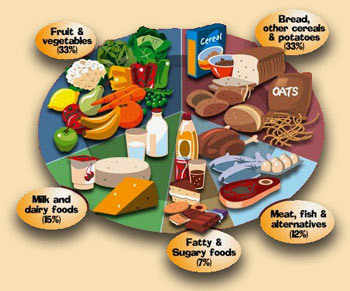 As you can see, meat, fish and other alternatives should only be 12% in your diet while fatty and sugary foods should only be 7%. If you don't get into the habit of eating the right foods, not only will you age faster but you will also be at a terrible risk of Cancer and Diabetes. 9.) 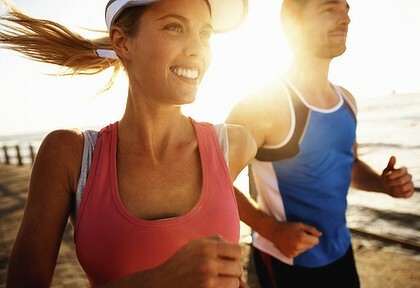 Exercise Regularly - We already know that exercise keeps our muscles toned and our skin firm. So with that being said, if you don't want to look all flabby, saggy and weak, you should know that exercise is not an option but a choice. Not only will it stimulate your metabolism to work well but it also aids to get rid of toxins and stress. This is not only beneficial to your skin but it is also important for your health. Always think long term. If you are not fond of exercising, why don't you play a sport that you like? If you enjoy what you are doing, you wouldn't notice the feeling of getting tired! If you are enjoying what you are doing, it will be in your heart to keep going! 10.) Avoid the wrong crowd - This is what many people fail to take note of. All of the items above, 1-9 will all be useless if you don't have proper discipline. Tto be able to have discipline is to be able to get rid of negative influences around you. If you hangout with friends that smoke, drink and party, expect yourself to be at risk any time soon. Even if you don't smoke, second hand smoking not only contributes to Lung Cancer but it also throws toxins on your skin. Don't be surprised if you look more haggard than your friends. I am not saying that you leave your friends but it is important for you to consider your lifestyle. why don't you invite your friends instead so you can all get into the habit of living right? Be a support system! Always remember, learn to say "No"
Okay. So those are only the things that you need to take note of. It may sound easy but hard to do. It takes a lot of discipline. Always remember, health is an investment. I'm sure you want to look fresh even in your late 40s. You don't have to worry about getting under the knife or getting injections. As long as you start early and get into the right phase, people will immediately notice a difference in your appearance. 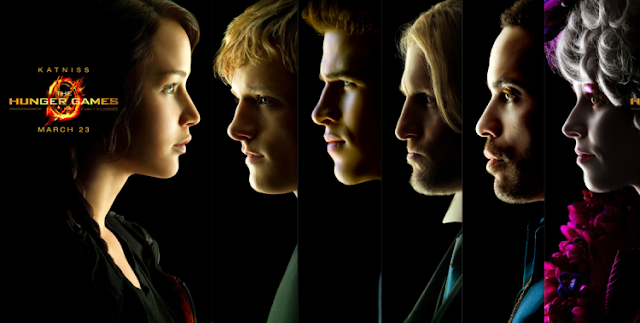 The Hunger Games is On! Oh. One thing I didn't like about it though wasn't about the movie but the cinema. The place is crowded with so many loud teenagers. What's ironic is that most of these kids are from my school. I thought I was watching a horror movie because I hear viewers shout every now and then. The couples at our back are already telling the story like it's nobody's business. "O sige na teh, ikaw na ang nagbasa ng libro!" It was so annoying! I just had to look back at them and give a stern face. A cinema is like a library, you don't have to open your mouths. You just have to watch. Eeeh. Oh well. That's what you get for watching on the first screening. A registered Nurse and a Medical Student. Blogger than a chatter. Sweet but Feisty. Frank yet tactless. Young and adventurous. Ambitious and determined. Incomparable and uncontrollable. Oh well. Whatever.